SANTA FE, Bantayan Island—The doors are decorated with images of Jesus and the Virgin Mary. Colorful flowers and vegetables are growing on carefully laid-out lawns. Dogs roam free, friendly even to strangers. At the center of the village, a Christmas tree made of recycled water bottles remain, a cheery memory of the past holiday party, the community’s first ever. Makeshift hoops mark the end of still unnamed streets, not yet paved but not an inconvenience. What was once a lifeless parcel of land full of grass and sharp rocks in Barangay Maricaban here is now a community of survivors raring to move on—the first batch of new homeowners in a multiyear housing program of the Prudence Foundation, the charity arm of Prudential Corp. Asia (PCA), for residents rendered homeless by Supertyphoon “Yolanda” (international name: Haiyan) in 2013. The rising community is what a second chance looks like. By any measure, it is what recovery is supposed to be. “I am thankful because you cannot just get a house like this,” said homemaker Norma Layling, beaming as she showed her family home, the front of which is modestly landscaped with a variety of plants hedged with large seashells. Her neighbor Beverlyn Vergara could only be thankful that her family had finally found safe shelter. Vergara, a mother of four said that “We are very happy. We feel safe here and my children no longer get sick, unlike before when we were living near the sea after the typhoon, where they were always exposed to the dirt in the sand,”. Leonarda Esparcia’s water-refilling business is now back to busy, with her family settled in their new home. She also gets to sell some of her harvest from a small vegetable nursery she put up across her house, where she grows eggplants, tomatoes, okra and upo. Esparcia said that “We are now comfortable in our house and we are able to do business selling water again. When our house was destroyed by the typhoon, our business suffered,”. For most Maricaban residents, it’s the first time to have sturdy shelter and proper utility services. Retired Gen. Carlos Holganza, Habitat for Humanity chief operations officer for the Visayas and Palawan, said that “It’s the first time for them to have concrete houses, to have light and water. And [last December], it was their first time to have their own Christmas party,”. Habitat has been Prudence Foundation’s partner for its housing project since 2014. 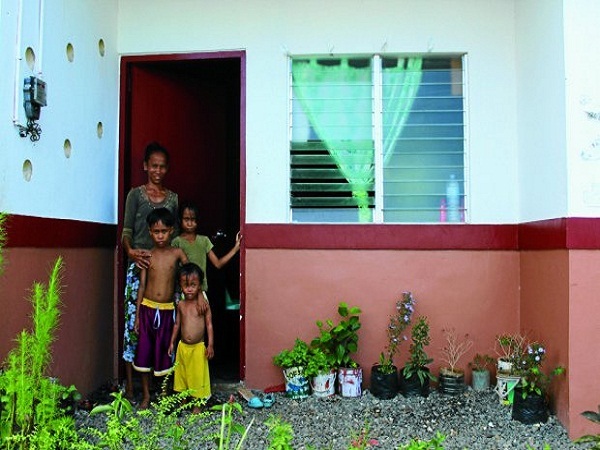 A total of 64 families moved into new 30-square-meter, disaster-resilient and solar-powered houses in September last year, pulled out of ramshackle shanties they’ve had to endure in the wake of the typhoon. The houses comprised half of Prudence Foundation’s $2-million housing pledge for Bantayan Island, a heavily devastated area that the charity chose for its postdisaster outreach after it noted tepid recovery assistance to the severely affected municipalities.